On the eve of the Consumer Electronics Show (CES), there’s an itching feeling in the air that this year isn’t a big year for Samsung. The company unveiled (literally) a smaller version of last year’s big TV, the Wall, featuring MicroLED technology at an event in a ballroom. More than one person wondered, what’s the difference? The answer, awkwardly, is everything and nothing. Samsung’s hot new TV is a 75-inch MicroLED display that exists as a proof of concept that proves a concept. MicroLED technology is scalable, versatile, and attainable, the company expressed in a four-hour-long showcase at the Aria hotel in Las Vegas. The fundamental technology behind the TV made its debut a year ago in an event space north of the Strip, where Samsung revealed the Wall concept. That 146-inch MicroLED display was billed as a new type of modular TV that could be any size and any aspect ratio because it was made of Micro LED tiles. These tiles, in principle, could snap together to create an endless array of displays, though Samsung didn’t do that demo. This year, Samsung did the demo. In addition to the smaller version of the Wall, the company revealed tall, skinny MicroLED displays alongside long, fat displays that broke into pieces. Samsung also had a hulking 219-inch version of the Wall, which frankly looks like the highest resolution digital billboard you’ve ever seen. This all served as a compelling illustration of what what this new MicroLED technology can do and how Samsung thinks its modular aspiration could unfold—conceptually speaking, of course. Before we start scratching our heads about why anyone would want a tall, skinny TV, let’s talk more about MicroLED technology. Currently, the TV market is dominated by liquid crystal displays (LCDs) that are backlit by light-emitting diodes (LEDs). Everyone just calls these LED TVs to avoid drowning in the alphabet soup. There are also organic light emitting diode (OLED) TVs that make nerds swoon. The big difference between two is that LED pixels needs a backlight that creates colour through colour filters, while OLED pixels emit light and independent colours on their own. MicroLED technology is a fantastic Frankenstein combination of both approaches. While they emit their own red, green, and blue colors without the need for an extra backlight, MicroLED pixels don’t rely on organic compounds like OLEDs which means they don’t degrade in the same way. They’re also very energy efficient, a detail that’s attractive for mobile device designers. Frankly, MicroLED displays are appealing for a lot of other reasons, too. In principle, they can produce those inky black blacks that OLED displays are famous for while also delivering tremendous levels of brightness in a slimmer package that use less power. This compendium of geeky detail, oversimplified as it is, is surely why Samsung dedicated this year’s TV showcase at CES to MicroLED technology. Yes, Samsung sort of did that last year by revealing the Wall, but this year, the company showed off its ambition to make MicroLED technology scalable. Alongside that 75-inch mini-Wall, the company also revealed Windows, smaller MicroLED panels that could (conceptually) be combined and rearranged to make all types and sizes of different displays. 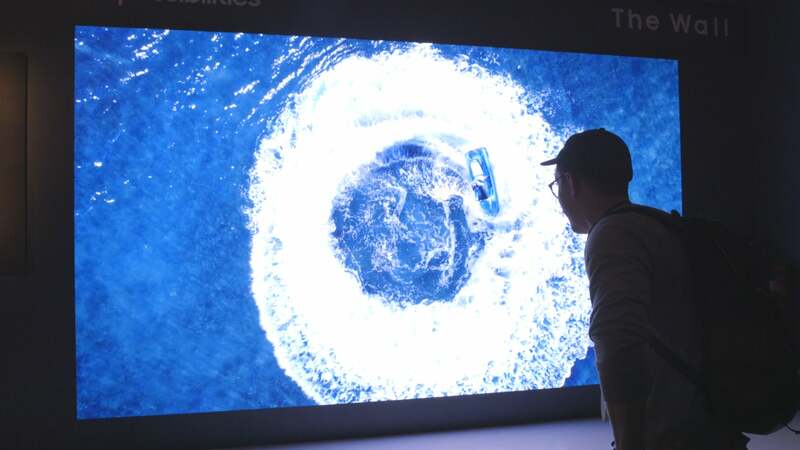 In one corner of the event, Samsung used an elaborate series of mechanisms to demonstrate how MicroLED displays could produce tremendously high-quality images in a wild range of configurations. There was a really long display that transformed when one panel was removed and another was added. There was another that involved an audio panel being added and then taken away. One configuration involved a Samsung staffer peeling back pieces of the display that was attached by magnets. Based on the demo, it all looked truly modular. Don’t get too excited. Samsung did not announce any plans to make these amazing magnetic MicroLED displays available to consumers any time soon. It’s actually unclear if the modular elements will ever come to market. Based on the conversation in the room at the CES event, Samsung simply wants people to know that it’s perfecting the MicroLED technology and that it’s serious about the modular concept. The clever observer might assume that Samsung is thinking hard about how MicroLED displays might work in mobile environment. This thought exercise would be massaged by the fact that Apple is reportedly working on its own MicroLED displays in a secret facility. While Samsung wants its customers to start thinking about MicroLED, too, the company is still going to release new TVs. Buried in the press release about the new Wall and Window displays, there’s a note about new 8K QLED models coming out in 2019, including a 98-inch model. And while a TV that big could fill up the entire living room of a London flat, it’s still a little runt compared to the 219-inch Wall concept Samsung built with MicroLED panels. So this strange feeling that Samsung’s big TV showcase at CES seems somehow underwhelming is ultimately intriguing more than anything. It’s underwhelming in the way that OLED demos must have felt kind of mind-boggling a few years ago. Nobody really knows when or how this new technology is going to make its way into gadgets we use and love quite yet. Samsung hasn’t said when its new 75-inch MicroLED display will be for sale, and if you’re thinking about the long game, that detail doesn’t matter much. MicroLED technology might be what’s in your smartphone or watch in a few years. Heck, it might be the way you’re able to rearrange the TV on your wall in just as much time. It’s cool, and it’s confusing. And isn’t that what CES is for?